No peas in this one. But easy it is. Kaachi-paaki, literally translated from Gujarati, means uncooked-cooked. Or raw-cooked. That's what this sabji is all about. It's partly cooked to retain the inherent flavor of the vegetable, in this case cabbage, as well as a fresh crunch. For best results, the cabbage needs to be shredded very fine so that the fiery tempered oil can coat every strand of the vegetable. I usually buy a bag of Angel Hair Coleslaw and ignore the fact that some brands also contain carrots. When I am in one of my moods though, I do spend some time slicing the cabbage into fine strands with a sharp knife. Add mustard seeds and when they start to pop and splutter, add asafetida. Keep a splatter screen ready to prevent a mess on your stove. Add cumin seeds, curry leaves, green chillies and urad dal. Lower the heat and fry till the urad dal turns golden in color but without burning any of the other seasonings. Turn up the heat, add the coleslaw, salt and lemon juice and toss quickly till the coleslaw is nicely coated in the oil. The more time you spend on this, the less crunch you get. Take the pan off the stove and garnish with cilantro, if you are using it. Allow the flavors to meld and serve with hot rotis or eat it by itself! It's great warm or cold. Use more green chillies to up the heat. You can slice them vertically to blend with the cabbage. I avoid this because it gets too spicy for Medha. I have made this with dried red chillies as well and it is just as good. Add as much lemon juice as you like. I tend to make this a little on the sour side, sometimes adding as much as the juice of half a lemon. Depending on the amount of crunchiness you like, adjust the time you spend tossing the coleslaw on the stove. I've had it several ways: less crunch, easy to chew and less noise at the dinner table! More crunch, more noise, more flavor! We like it crunchier. With Angel Hair Coleslaw, this Kaachi-paaki takes about 5 minutes to make! Try it with red cabbage, too! And yes, I buy Ready-Pac shredded red cabbage if I can find it. Trivia: This is what we had for dinner exactly a year ago today. (And, several times every month since it's so easy to make and a real favorite with us.) It's kind of interesting how my photo archives are more focused on food and landscapes than on portraits! I need to fix that! Or do I? Update: I am sending this to Kalyn's Kitchen for this week's Weekend Herb Blogging, which calls for recipes and/or informative posts featuring any herb, plant, vegetable, or flower. Veggie, it is. Cabbage. I didn't realize how hungry I was until I read this post! It sounds delicious. the cabbage doesn't stink when you barely cook it. i think that's the idea. years of eating soggy oily stinky cabbage has completely put me off that veggie. this sounds yummy. and i like coleslaw - without mayo. Love everything about this dish! and your description of it is making me hungry :-D. it would make a great sandwich stuffer, isn't it :). This is a very healthy recipe and sounds easy to make. My husband is a gujarati and I am just beginning to learn their dishes. Will definitely surprise him with this. Thanks Manisha. This is a winter staple at our table too...The Marathi version is also quite similar though without the urad dal and the lime juice. I have eaten an even simpler version in Gujarat -I think they were calling it sambar, ad was served as salad. It had just mustard seeds in the tempering and maybe just a hint of turmeric - very good too. C'mo now - about the cabbage chopping! Cabbage is the veggie I pick when I am feeling lazy - a snap to wash and maybe one and half whole minute to chop? :D Besides we don't get Angel Hair Coleslaw! This looks so inviting and healthy. Lovely recipe. great, I love this. We call it sambharo. Average Jane, it's delicious and it's healthy! Bee, I always wondered why other kids hated cabbage and cauliflower. My Mom never cooked the life out of these veggies mainly because of my Dad and his preferences. Overcooked soggy cabbage and cauliflower both smell rather fishy! I'd rather eat real fish instead! Try it, you might start liking cabbage again! Musy, you're like me! Yes, I have stuffed many a pita with this! Deepz, this is the simplest dish to make and especially if you get a bag of fresh crunchy coleslaw. Hope you both enjoy it! Anita, see what Saju has to say - it's sambharo! You must be Superwoman cos even the Maharaj (cook) couldn't do it in less than 2 minutes! We're not talking big fat chunks chop here. We're talking very fine strands! You have to find the angle that will give you long thin strands and they need to be of almost even length. That's why Angel Hair Coleslaw and not regular Coleslaw. And that's why better the Maharaj chopped this than me! This is the most popular cabbage sabji in our home. If I have to cut this like the Maharaj did then clean-up is not fun! Swapna, you too are Superwoman! Saju, thank you for that! I learned this from the Gujarati family that my sister married into. Yeah yeah. Know all about the angle and the fine shredding - remember I married into a Marathi family? My MIL did call me Frontier Mail BTW :D and I use the big chef's knife for the job. Try stuffing this into burox - basic bread dough stuffed with this, gathered to make flattish parcels, and baked. Perfect for a brown bag lunch! looks yumm..and i prefer the crunch factor!!! i usually roll this in a chapati and get my toddler to eat it.. This sounds wonderful, and really sounds like an Indian dish I might would make. Of course I would definitely use the cilantro garnish! With a lot of Indian dishes I'm intimidated by too many ingredients I don't recognize. I've learned what asafetida is, and I think I figured out that kadipatta is chiles, but I had to google urad dal. It's a type of black lentils, right? Bookmarking this recipe, since I love cabbage. Excellent-crunchy,healthy,easy all rolled into one! Happy Cook, I hope you and your guests like it! Anita, Frontier Mail? Now that's funny! I always thought of you as Shatabdi! Burox sounds nice, ready-made pitas sound even better on my schedule! Rachel, hats off to your toddler! Medha refused to chew when she was little! Kalyn, very honestly, every day food has few ingredients, at least in my home it does! A close friend of mine just told me that she does not cook with asafetida even though it is one of the essentials in an Indian kitchen. It took me back to the days when we lived out of a suitcase and travelled extensively. I have cooked without asafetida, too, but given a choice I would always include it. A pinch is all you need but you need a pinch of the good stuff. Kadipatta is curry leaves. That's the green leaves you see in the picture of cabbage in this post. A better picture is on this post - scroll down for the picture with ingredients. Again, if you don't have it, you can skip it. You need to buy it fresh from an Indian grocery store. It adds a wonderful aroma. If the leaves are slightly old, I tear them a little bit. It doesn't look that great but you get the flavors! Yes, urad dal is a type of black lentils. You can buy buy them whole with the skin on (whole black urad), whole with the skin off (whole white urad or just whole urad), split with skin on (split black urad) and split without the skin (urad dal). Usually the last type is just labeled urad dal. This dal is known to have wild yeast and is used to make idlis and lots of other delicious foods. When it is tossed into hot oil, it becomes crunchy and adds a nutty taste to the dish. It's another ingredient you can omit if you don't have it. I wouldn't exclude anything else! 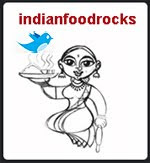 You must also take a look at vahrehvah.com if you like Indian food so much. I've picked up some tremendous knowledge from there and you might want to see that too. Kelsey Poole aka VahrehVah marketing and comment-spamming stooge, it's amazing what VahrehVah and Sanjay Thumma will stoop to! First their web site stole images from our blogs without permission or even an acknowledgement; then Sanjay Tumma came around telling us how much he loved us all; now VahrehVah is comment spamming our blogs! Vahrehvah.com, Sanjay Thumma and his marketing spammers, you need to STOP! You are losing credibility with every move you are making. Please stop and review your marketing strategy. And try to focus on simple things like: do not steal, do not copy, do not spam! And certainly do not try to pull a call-center trick on us by using names that "sound" non-Indian. We are NOT stupid. At least I am not! Any more comments from Vahrehvah stooges will be deleted. 2) %^%%^&^&(*(*&%$$%#@ I can't believe vahrehvah had the guts to pull something like that. I recently got an e-mail from a friend who recommended the site if I liked cooking. I had to e-mail her back to say she should avoid it at any cost. In fact, I gave the links to some of my fav blogs, including yours. So, my point is, these people are actually getting other people to browse their site even though most, if not all, the recipes are actually from bloggers. Shame on them!! Sambharo looks lovely, 2 tablespoon oil? Does it require that much or did you mean 2 teaspoons? I don't use too much oil in mine. Manisha try a V slicer for cabbage shredding it works well and its done in a jiffy. Nabeela, great minds think alike! I'm always looking for new things to do with cabbage. Anita's suggestion about burrox is also quite inviting! As for VahrehVah, I don't know what to say about them! If the guy is such a great chef, I don't know why he needs to stoop this low. Anjali, it's 1-2 T, so use less if you like. Generally, Gujarati salads and sabjis use a little extra oil than normal. A bag of angel hair coleslaw is about 12 oz and that's a lot of shredded cabbage. I generally avoid V slicers and mandolines because they become one more thing that I have to figure out how to store. There is a huge resistance in this house to build or acquire cabinets in addition to what the house came with. Same goes for shelves. And it works well because I don't accumulate much stuff and is in line with the philosophy of "Voluntary Simplicity". So I have learned to buy only that which I really need and in the long run, it is quite liberating. I am looking to spend all that I haven't spent so far on a good set of knives instead! This looks like it would make a cool party dish! Thanks, Manisha! I may take you up on that one of these days. 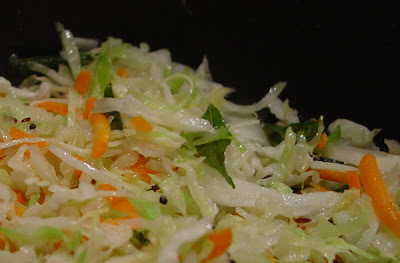 My first real attempt at blogging food with a close-up photo was Hot Indian Slaw, found via Kalyn's Kitchen (Hi Kalyn!). I do wish there were some really good Indian restaurants here, since most of the places I've tried just aren't all that inspiring. Your blog is definitely more so, but I lack a baseline for taste comparison, you know? Whoops, I clicked through your link from the curried pumpkin dish and commented here rather than there. Gay Carillo, welcome! It's great by itself or stuffed in pitas. Try it! Your guests will love it! Kitt, no probs! I know what you're referring to so I have the context just fine! Maybe the next time we do a cook together, we can have you over!